The Spirit’s Edge Shamonial Temple had its in-person Winter Solstice / Yule Ritual & Salon on Sat., Dec. 15. While this online version is a greatly pared down version of our in-person ritual, it is powerful in its own right and will connect you with the greater workings of our Temple. We partnered with the Threefold Isis, the Triple Goddess, in an Adaptation of Dion Fortune’s Original Rite of Isis! We also partnered with Hermes who is one of the three anchor deities at the head of the Temple of the Twelve Signs on the Inner Planes, supporting the Great Work of our Spirit’s Edge Shamonial Temple on the physical plane. The three Goddesses are also Guardians of our Temple. If you have access to the book Dion Fortune’s Rites of Isis and of Pan by Gareth Knight, which contains Dion Fortune’s Original Rite of Isis, you may pull additional material from the Rite into this online ritual. 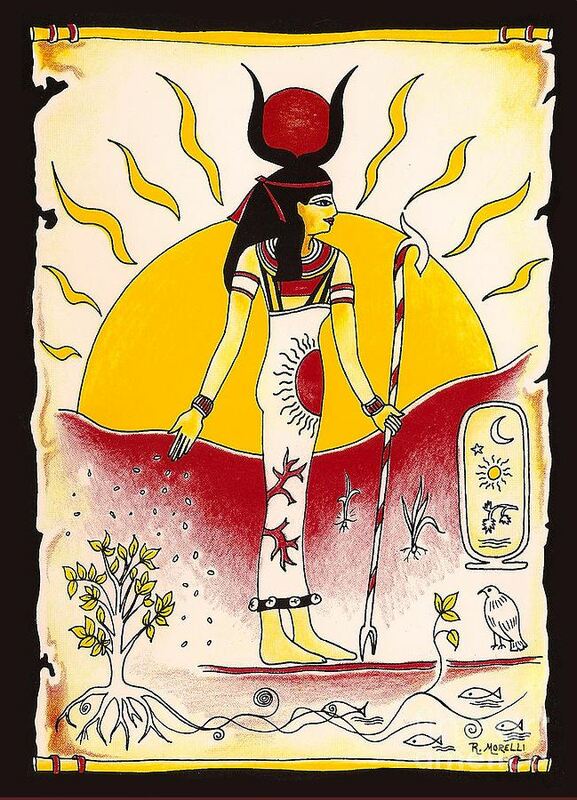 Though HPS Kassia S. Morgan invoked Isis during our Spirit’s Edge ritual, and the original Rite calls for invocation, this online ritual is written to evoke the Goddess, i.e. to bring Her into your presence, *not* into your body. Dion Fortune is the Master Teacher on the Inner Planes for Kassia S. Morgan. At our Spirit’s Edge Winter Solstice Ritual, we also celebrated with joy and mirth through the power of the Green Ray, the magick and Love and Light of all of Nature! During our working we sojourned into the gardens for contemplative meditation with the Moon and all of Nature, and offered our sacred prayers. In this online ritual you will have time for that as well during the working portion of the ritual. Our Temple’s Ritual was a joyous ritual of the Light growing within each and every one of us, and we share that Divine Light with you through this online ritual! Blessed be! In our Spirit’s Edge Shamonial Temple & Tradition, we have three candles representing the Three Rays on every altar, and we invoke those Three Rays in each ritual working. The candles each have the Ray isolated from our sigil on one side of the candle, and then our full Temple Sigil on the other side of the candle. Our Three Rays are the Red Ray (Brick Red, IxChel, Power/Will Serpent/ Infinity), the Blue Ray (Cobalt Blue, Hathor, Love, Alpha/Omega) and the Gold Ray (Temple Gold, Hermes, Wisdom, Starburst). Many traditions hold the Rays as part of their teachings and core structure, particularly Three Rays, and many traditions also use the colors of Red, Blue and Yellow specifically as the main Ray colors. Some work with a Seven Ray system and incorporate more colors. Rays are all about Divine Light and Love and Divine Energies. There is a great deal more within our Temple’s Sigil, such as the 12 Gods, 12 Goddesses, 12 members of the Hidden Company, and the three members of the Hidden Company who are currently at the head of the Temple of the Twelve Signs on the Inner Planes (Dion Fortune, Gerald Gardner and Aleister Crowley), but today’s focus is specifically on The Rays. 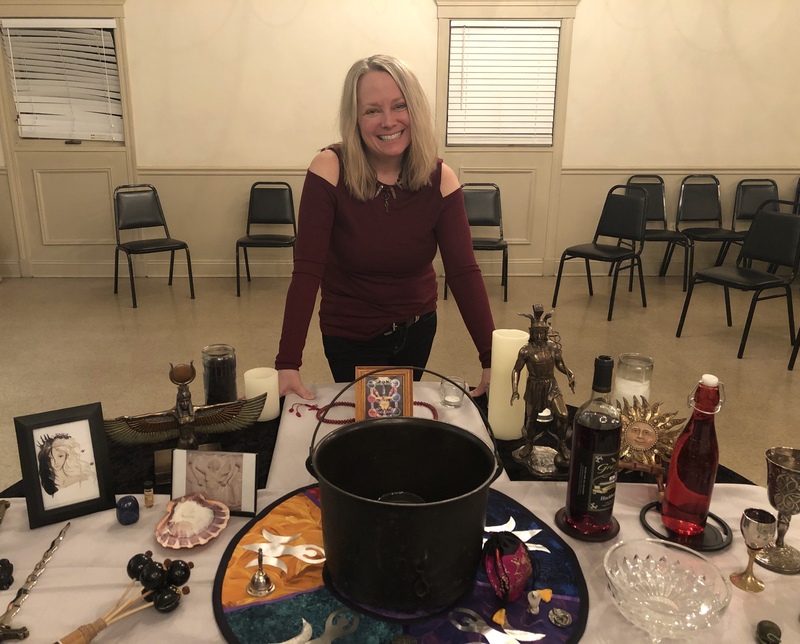 For another example, at our Mabon / Autumn Equinox Ritual this year, we partnered with the Violet Flame and the Violet Ray, along with Archangel Tzadkiel, who is also one of my personal guides/teachers. From time to time, we are called by the Divine to partner with other Rays in addition to our Three Rays. Just because the Three Rays are woven throughout our Tradition, including in our sigil and tying into the three anchor deities of our Temple and Tradition, we still may work with other Rays as Spirit calls. Dion Fortune’s order, The Society of the Inner Light, had three rays, which has the Blue Ray and the other two were different colors. Dion’s focus was The Three-Fold Way. It was a three-fold balance of elements of the Western Esoteric Tradition known as the Hermetic Path (blue), the Green Ray Path of elemental and nature contacts (green) and the Mystic Path (purple). Here is an excerpt from the website of the Society of Inner Light. The Three Paths before you are separate in method and discipline, yet one in their ultimate synthesis. They are the three faces of the Pyramid of Spirit and according to how you view this Pyramid, it will appear either as the Mystic, the Hermetic or the Path of the Green Ray. When you have climbed to the apex, you will see the three are in fact one. If your way is devotional, you will incline to the Mystic Path. If that of will and wisdom, that is the Hermetic Path. If your way is that of the love of beauty and its expression, you will incline to the Green Ray. But remember, what seems to you a Path is in very truth a Pyramid. Consider the nature of these three Paths. On the Mystic Path the Ego casts aside everything that separates it from God. It seeks to know even as it is known; and the mind cannot know God. It even casts away the mind to enter into the Divine Union. All that is not God to it is dross; and it purges and re-purges the soul until nothing remaineth but pure spirit. On the Green Ray, man seeks God in Nature and worships Him there, saying, ‘How can I know That which transcends knowledge? Nonetheless, I can feel life urge within me, and that life is of God. Therefore I will worship God where He may be found – in the life-urge within my veins, in the inebriation of the subliminal self.’ Thus energised, the god within rises up and knows the Very God after his own manner. 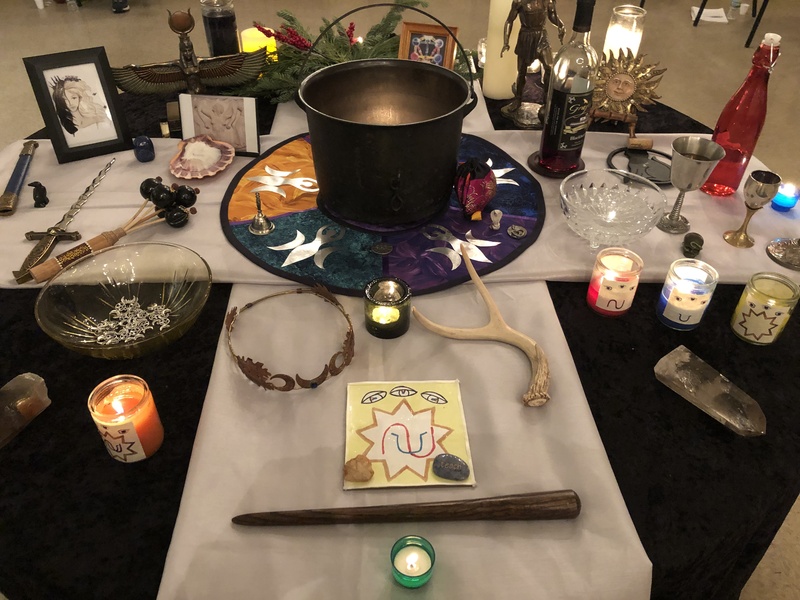 The photos from our Yule Ritual are in our Spirit’s Edge Shamonial Temple page Yule / Winter Solstice photo album HERE and in our Spirit’s Edge: A Seeker’s Salon FB group page as well HERE (just click and ask to join – all are welcome! and then you may view those photo albums as well). We also have event pages through our Temple page and our group page for all our upcoming rituals, including our next ritual for Imbolc on Jan. 26. All are welcome! This Winter Solstice ritual and night were filled with the most incredible Light, Love and Peace! We communed with the beauty of Nature, the Love of the Earth, the Light of the Sun and the Flame of Spirit within each of us! You are welcome to perform your ritual at any time, and it will tie into the main working of our Temple’s Ritual. The Winter Solstice is at 4:28 p.m. CST on Fri., Dec. 21. The Full Moon is 11:48 a.m. on Sat., Dec. 22. This would be a great time to do this ritual if that timing works for you. There is also the peak of the Ursid Meteor Shower making this a magickal trifecta of festive energies! But there are more options that fit perfectly with the energies of this ritual! Christmas Eve is Mon., Dec. 24, and Christmas Day is Tues., Dec. 25. New Year’s Day of course is Jan. 1. The Twelve Days of Christmas starts on Christmas Day and ends on Saturday, Jan. 5, 2019. It is also known as Christmastide, Twelvetide and Twelfth Night or Epiphany Eve is Jan. 5. It is a period of celebration, feasting and Saints’ Days. The energetics of any of the above timing is perfect for our online ritual! Prepare your altar space with your images of the Three Goddesses, the God, something to represent Nature, your five candles, your Triple Goddess symbol/representation to charge during the ritual, and your other supplies. Then prepare yourself and your space according to your preference. You may cast a circle and call the quarters if you would like, but it is not necessary. She is Isis Veiled and Unveiled! She is the Threefold Isis! Oh great Goddess, join us in this sacred Solstice Rite. Join us in this sacred Solstice Rite. Flower of the foam, rise from the wine-dark sea. Shaddai El Chai and Reha, Binha, Ge. 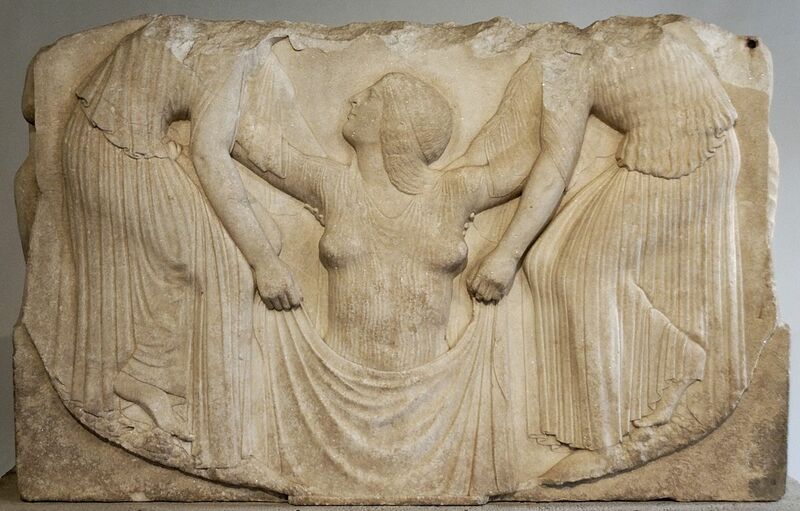 O Isis veiled and Rhea, Binah, Ge. The hour of the Yuletide draws near. Shaddai El Chai and Rhea, Binah, Ge. I am the Threefold Goddess. I am Isis. Out of whose depths life wells eternally. The Inner Earth where lead the Pathways Three. Selene of the Moon, Persephone. These are my secret, these belong to me. 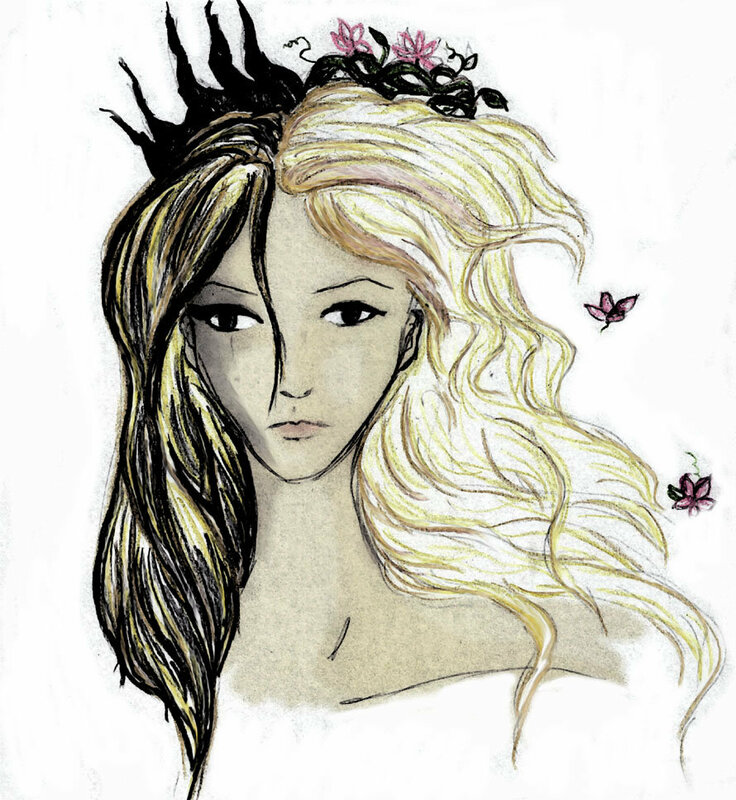 Hers in heaven, on earth Persephone. Hear and appear Threefold Isis, in all your names and forms, I call thee forth, Isis, Persephone and Aphrodite. Commune with me now. Blessed be! Next, sit in communion with the Threefold Goddess. Sit in meditation and contemplation. At this time, write or speak your sacred prayer to the Threefold Isis and to the Moon. You may wish to walk outside now in contemplation, letting your circle be held in sacred space while you sojourn outside, to send your pray to all of Nature through the Threefold Isis. She will hold and protect your sacred space while you are outside. And then, once you have communed with the Goddess and given your prayer to the celestial heavens and all of Nature, you may also seek the wisdom of the God Hermes to see what message he may have for you as well. You may wish to journal. You also may wish to take a little time and walk outside into nature, and then come back inside to finish your ritual. They will hold and protect your sacred space. If you wish, you may build power through rattling or drumming to charge your Triple Goddess symbol or charm with the power of this Rite, yet the quiet contemplation of this working with the Threefold Isis is all the power that is truly needed and your image/representation of the Triple Goddess will be charged by that Intent. The Threefold Isis stands ready. At this time, you may choose to speak words of love and gratitude to the Threefold Isis, to Hermes, to the Green Ray, the Moon and all of the Helping Compassionate Spirits who have joined you. When you feel you are finished, thank the spirits for their presence in your space and wish them farewell, extinguish your candles or let them burn to completion as you prefer. Then close your circle according to your own tradition. Place your charged image/representation of the Triple Moon/ Triple Goddess on your altar or in a special place where you’ll see it often and be reminded of your work. Wishing you all Love, Light and Sweet Blessings this Winter Solstice! May the Light warm you through the darkness of Winter, and may you always feel and know the Light within and without. 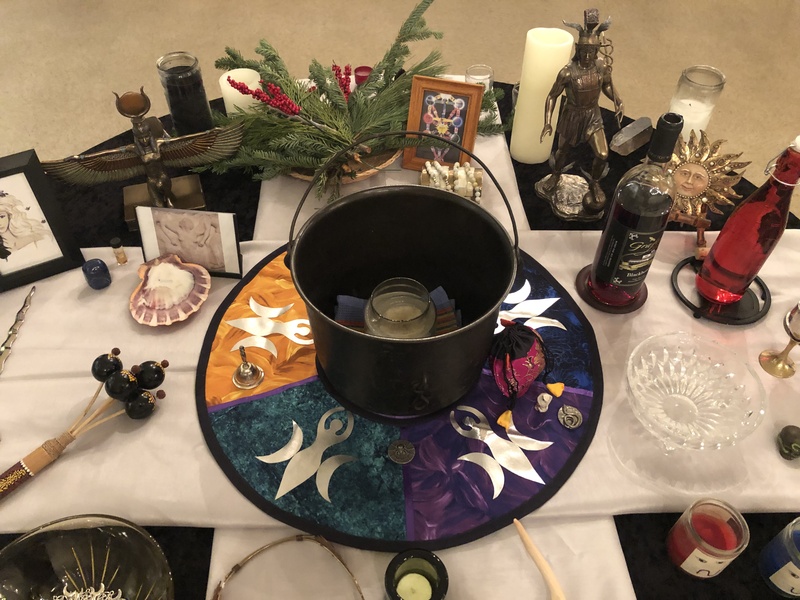 Our Temple’s Winter Solstice /Yule Ritual was written by Temple High Priestess Kassia S. Morgan unless noted otherwise, and all rights are reserved. It may be used for your personal/private use only. If you wish to use this or a variation for a group in the future, please contact Kassia S. Morgan for the Spirit’s Edge Shamonial Temple at ravins52252@mypacks.net for permission; this ritual may not be published or used publicly elsewhere without prior written permission and attribution.